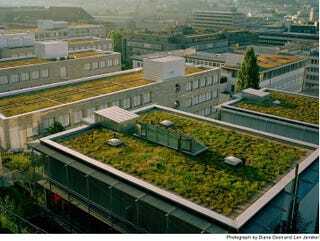 Many countries like Germany (pictured) and Switzerland are now mandating that all new buildings with flat roofs must plant a garden on them. What will cities look like when this practice becomes the norm? Here you can see a Chicago rooftop, whose green garden looks like a luxury rather than something that's been mandated. And then there are buildings like this one in Vancouver, which goes beyond roof greening to turn every single wall into a garden too. Imagine entire cities with skyscrapers that look like this. It's possible that one of the best ways to create energy efficient cities will be to create buildings like these, where plant life helps to regulate the structure's temperature. Rooftop and wall gardens could also become farms. In Tokyo, where the "urban heat island" phenomenon has raised local temperatures by several degrees, city officials are mandating green roofs like this one to make buildings more efficient and bring temperatures down. Heat islands are caused when cities have so much asphalt and cement that they absorb and trap heat. Environmental planners hope that green rooftops will cool the city off.